I went to see Toy Story 3 in 3D (great film, but the 3D was not worth it); so I have a pair of those cheap plastic “3D” glasses. 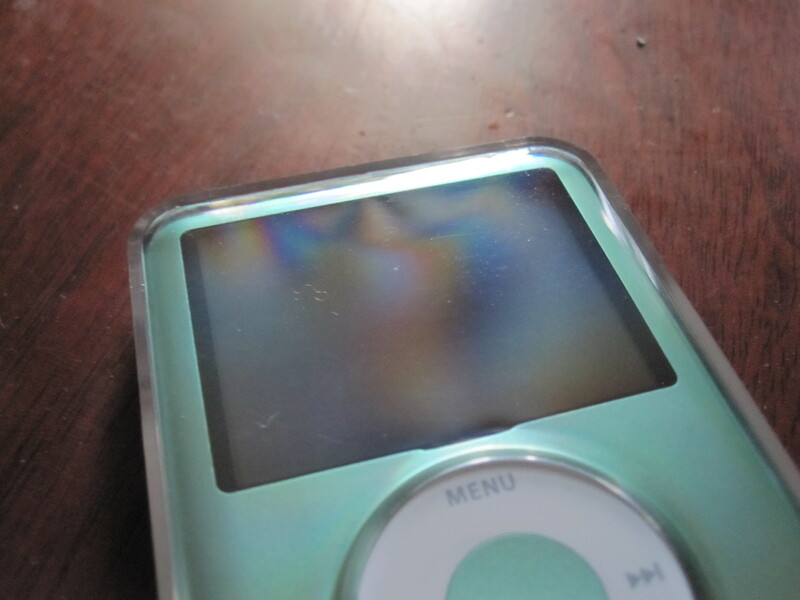 Above is a picture of an iPod taken through one of the lenses (of the 3D glasses). 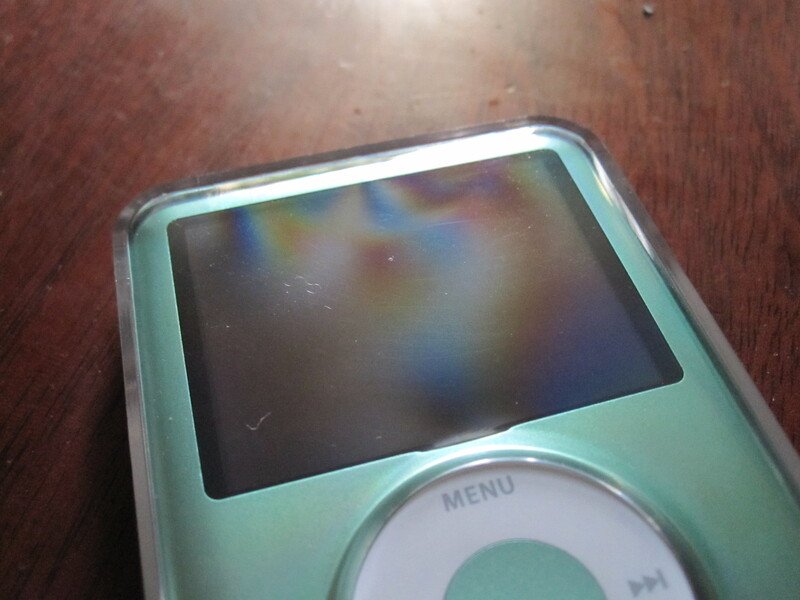 The coloured pattern is, I think, due to birefringence, but I’m not competent to explain it entirely. So we see that the lens can be used to see patterns that are otherwise not visible. In this case, we can see stress patterns in the plastic (I think). Looking a bit more carefully at the iPod pictures, we can see that the patterns on the iPod are different for the two lenses. Thus, there are two different sorts of light that each lens passes. My explanation of this is that the light acquires a property as it passes through the lens, and the mirror changes that property so that light with the new property cannot pass through the lens. The property is the handedness of circular polarisation. 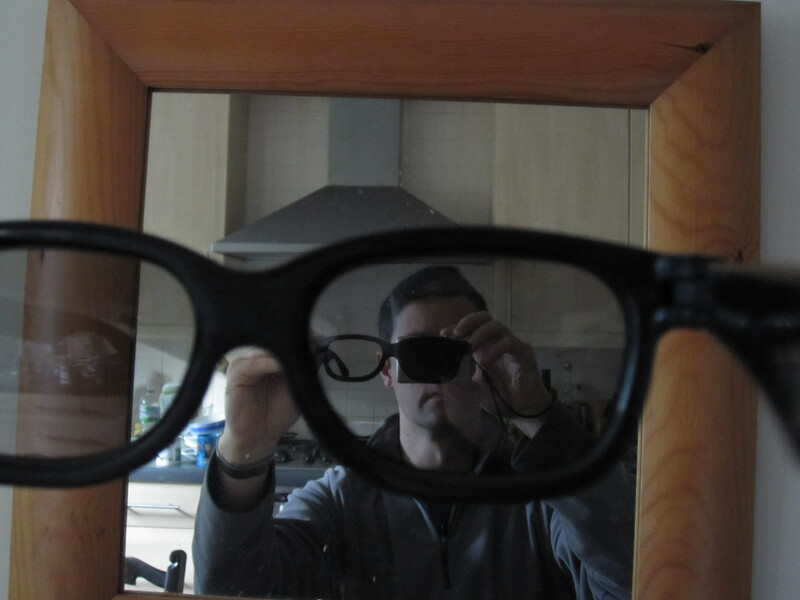 The right-hand lens filters the light so it contains right-circular polarised light (say); the mirror reflects it into left-circular polarised light which cannot pass back through the lens (and into the camera sensor). 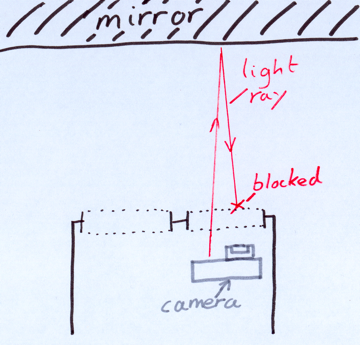 Note that light that passes through the left lens and is reflected in the mirror, can pass through the right-lens. 3D films work by displaying one frame through a left-circular polarising filter, and the next through a right-circular polarising filter, and alternating. A reflective screen with the right properties will maintain the separate polarisation of alternate frames. Circular polarising filters in the glasses are insensitive to viewing angle, so it’s a superior option to linear polarisation.